Quintin and I first met some years ago at the same crossroads in our photographic careers. It’s a long story but we were both thinking of taking the same big step and, as it happens, neither of us did. But we kept in contact and I became a great fan of his work. 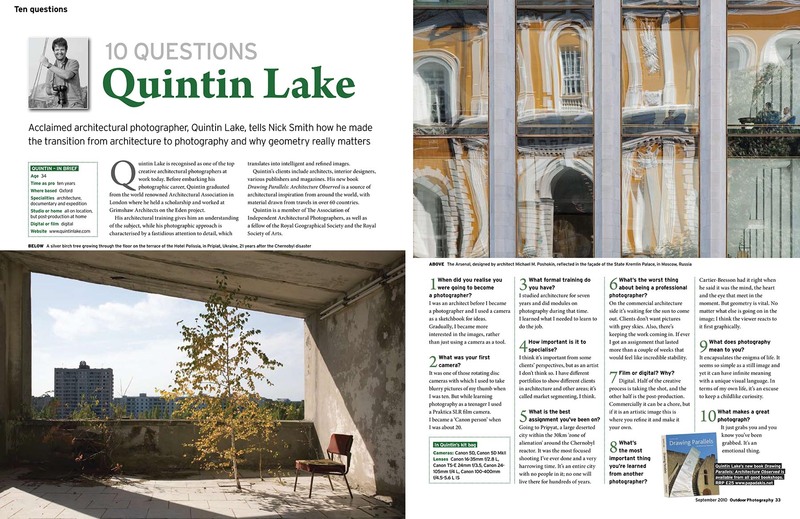 Quintin is ‘mainly’ an architectural photographer: that is the core of his business, his primary bread and butter. But like many photographers, his career is also his passion and his Fine Art work, which often combines elements of his architectural practice with travel, documentary and landscape styles, is a very natural extension of this core practice. The two series featured here, Chernobyl and Sweet Thames, are very different. Chernobyl is a fusion of architectural discipline, documentary bravery, intrepid travel photography and a Fine Art sensibility. Sweet Thames, one the other hand, is far less structured, more fluid (as befits its theme) and more obviously lyrical. Both avoid cod narrative in favour of a form of quietly passionate dispassion, if that makes sense. It’s worth adding that it’s not just me that rates his work highly: Quintin has recently been awarded 1st place in the ‘Architecture – Historic’ category for the Chernobyl series in the 2012 International Photography Awards. He also received three honourable mentions in the categories for Fine Art – Landscape, Architecture – Cityscapes and Architecture – Buildings. The rest of the words that follow are Quintin’s, and I hope you enjoy them and the images as much as I have. Because both series are quite long, I have embedded them as slideshows to expedite loading of this page. I also recommend Quintin’s blog, where you can see some of his architectural work, as well as more of his landscape and travel photography. Finally, don’t miss the ‘Methods and Approach’ section at the end. It is brief but highly informative! A silver birch tree grows through the floor on the terrace of Hotel Polissia. The hammer and sickle is visable atop the distant appartments. When reactor number four at the Chernobyl Nuclear Power Plant exploded in 1986 the result was the worst nuclear accident in history. Large areas of Ukraine, Belarus, and Russia were severely contaminated, requiring the evacuation and resettlement of over 336,000 people. Pripyat, 1km from the reactor, was designed as an exemplar of Soviet planning for the 50,000 people who worked at the power plant. A funfair, with bumper cars and Ferris wheel, was due to open two days after the reactor exploded. These photographs, inspired by Robert Polidori’s earlier images of Chernobyl, were shot in 2007 over 5 hours, apparently the safe period of exposure. Although a Geiger counter was carried in case of localised high emissions, certain areas of vegetation which attract a higher concentration of radiation were avoided. The physical devastation stems from looting and gradual building collapse, not from the explosion. Over the last ten years people have intruded regularly into the military exclusion zone, stealing everything from irradiated toilet seats to the marble cladding from hotel walls. Photographs of the town capture a memory of three traumas: the invisible radiation, the visible looting and the gradual collapse of a ghost town. The idea for the project started when watching the first few minutes of Danny Boyle’s Olympic Opening ceremony. Seeing the sped up aerial journey starting at the source of the Thames and ending up in London I immediately realised I wanted to walk the length of the river and try to produce an artwork based on that experience. I’ve recently got married and live with my wife in Cheltenham near the source, my childhood was in Oxford, half way along and I lived in London for seven years as a student so the river has a very personal connection for me. Earlier in the year I’d been in hospital with meningitis and then immediately afterwards witnessed the birth of my son so I started the journey with more sensitively to the notion of the river as a metaphor of life than I might have done otherwise. I’ve always been a keen long distance walker having backpacked Land’s End to John O’Groats and many of the long distance trails in Britain. I always travel alone and camp, as its cheaper (much cheaper in the Thames valley!) and gives me a greater connection to the landscape and allows me the concentration necessary to think about and notice interesting light for photography. It was surprisingly difficult to camp along the Thames as it relatively populated and I prefer to wild camp so I often pitched after dark and broke camp at dawn. The journey was 170 miles and it took me ten days. Whenever I work on a photographic project I think of the images as a series, to which I endeavour to give a particular and constant feeling. I never know what this feeling will be before I start a journey which is part of the thrill. In the artic this was the play of light, In Iran it was the architectural symmetry and on the Thames I felt it was the pattern and texture of the water. I purposely cropped out the landmarks to emphasise the difference of the texture and colour of the water. Before I started the journey I would never have thought that the water at the source could look quite so different to the same water as it passed under the M25 bridge. I make photographs of things I’ve never seen before. The desire to understand the visual world is the inspiration for my work. Geometry and stillness are qualities of space I’m particularly fascinated by. My background in architecture means I tend to abstract the world in terms of line, surface and form. My working method involves two parts. Firstly extensive walking and looking, photographing intuitively if a place interests me. Subsequently I’ll edit the material I have collected while thinking consciously about a theme or idea that the images suggest to me. My background was working with a 5×4″ sinar view camera but now, the 20+ megapixel full frame 35mm sensor cameras more than meet the technical demands of the industry (architects, developers and design press). I’m not excited about the new generation of 40 megapixel full frame sensor 35mm cameras as I consider the extra detail excessive and it increases processing time. Far more important than resolution is a flair for composition and light. The cost of buying or hiring a Phase One back and associated digital lenses is not proportional to what the industry pays and this type of camera reduces the propensity to experiment and play which can reduce creativity of composition. 35mm full frame lenses with excellent corner to corner sharpness and low distortion are essential. Tilt shift movements are useful not just for correcting perspective but for shifting the compositional emphasis of a scene. I work with Canon and my preferred lenses are 17mm f4 TS-E L, 24 f4 TS-E L and 70-200 f4 L. The ubiquitous 24-105 f4 L is also fantastically versatile and most of its problems can be removed in Lightroom; the Chernobyl series was shot with this lens as I was so short of time due to fears of radiation exposure. Architectural Photography is particularly sensitive to lens/ body calibration and I send my equipment to be calibrated annually. Useful techniques for architectural photography depending on the situation are exposure fusion which is a naturalistic version of HDR which increases the dynamic range by blending bracketed exposures. I use LR/Enfuse lightroom plugin for this. For interiors, tethered shooting can be very useful for previewing often complex Lightroom adjustments on the fly. Mirror lock up and a high end tripod and head are essential for pin sharp results. Aperture is best kept no higher than the f8-f14 range to avoid problems with diffraction softening the image. A Hoodman loupe helps focus the manual tilt shift lenses. Wearing a fluorescent worker’s jacket when using a tripod reduces people’s suspicion in urban areas and tends to make people walk quickly past the building. And I always carry a couple of door wedges for interiors photography!